You really ought to check this out. Dude, I'm gonna live forever. Funny, I just ate one of these Bela lemon sardines yesterday, a can from 1998 as it is well known that the older they are the best they are… But even the loveliest lady can only give what she's got… not much in this case : boiled fatty sardines, not able to improove in sweetness and savor. I even think that these sardines were canned still frozen! But the lemon was great ! 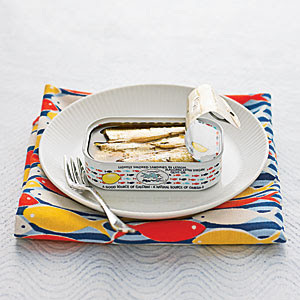 Anyway, I do know time is good only to fried canned sardines. I shouldn't wait so long to eat this kind. But as they were sold in a nice double drawer gift set, I maintain them, just for the pleasure to look at them !